What's Happening with Huntsville Real Estate? What’s Happening with Huntsville Real Estate? I know it’s a little different to see my Monday Morning Coffee come in on a Tuesday, but I enjoyed a day off yesterday with my family, and I hope you had a great long weekend also! I’m going to go over the July numbers for Huntsville real estate, but first, I have fantastic news to share with you today! Our team was recently ranked as one of America’s fastest-growing private companies by Inc. Magazine. We were selected based on our sales growth over the last three years, which totaled 104%. This list represents the most comprehensive look at the most important segment of the economy: America’s independent entrepreneurs. Companies such as Yelp!, Pandora, LinkedIn, and many other well-known businesses gained early exposure on this list. Now, onto our July market numbers. 2015 continues to be an excellent year as we approach the third quarter. According to the North Alabama MLS, Huntsville and Madison County residential sales totaled 600 units in July, a 19% increase over July 2014. This represents the best sales result for the month of July since 2007. 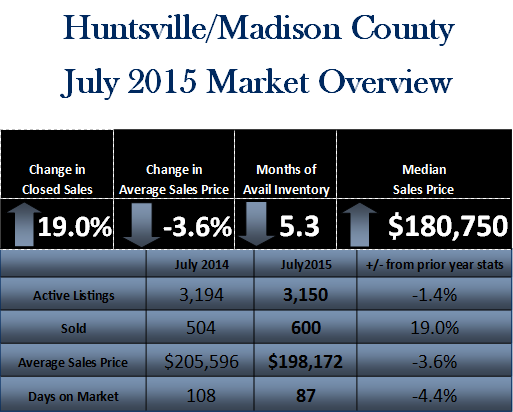 The Huntsville housing inventory saw a slight decrease of 1.4% from last year. However, the median sales price for July 2015 is $180,750, a 1.5% increase from July of 2014, and a 1% increase from June 2015. Overall, our market is doing well. If you have any questions, please don’t hesitate to reach out to us. We look forward to hearing from you!